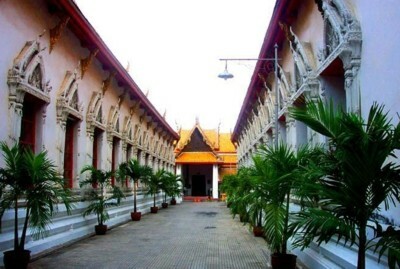 Wat Mahathat was once the home of the Supreme Patriarch, a powerful religious force in Ayutthaya. The temple (under a different name) was likely constructed by King Borom Rachathirat I around 1374. Its current name was given during the reign of King Ramesuan ( 1388-1395). Today, the central tower of the temple is a ruined mass of bricks. It first collapsed during the reign of King Song Tham ( 1610-1628) and was repaired during the reign of the following ruler, King Prasat Thong ( 1629-1656). The reconstruction raised the tower to 44 meters and thence to 50 meters when a 6 meter metal spire was added. The temple is the center of the Mahanikai school of Buddhism and the class in meditation.